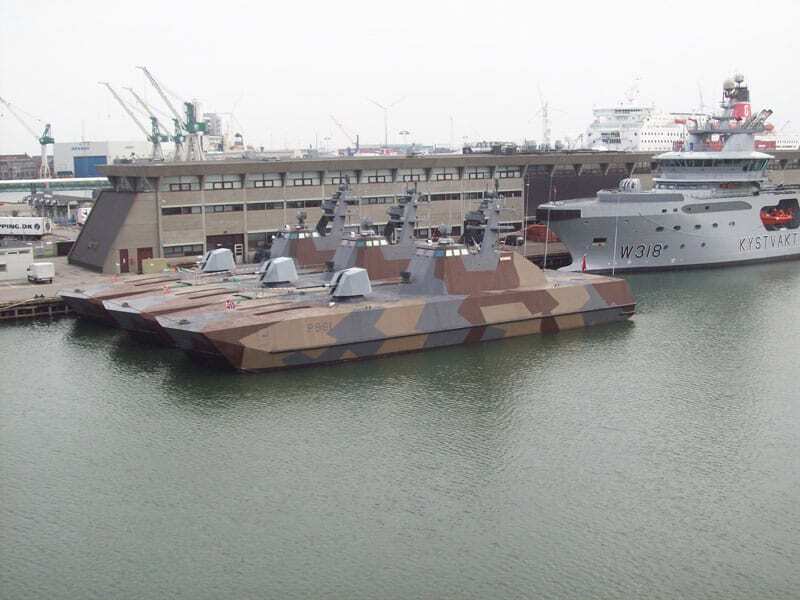 The small, stealthy, Skjold-class “coastal corvettes” such as HNoMS Steil can quickly sneak into the fjords along the Norweigian coast. But when they strike, they pack a lethal punch, and an enemy might never know what hit them. 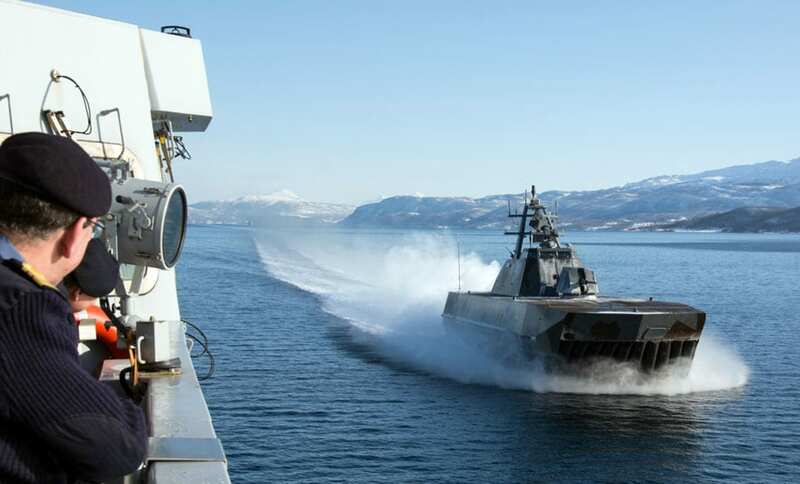 HNoMS Steil is one of six fast attack craft of the Skjold-class of all-composite, gas turbine with waterjet propulsion surface effect ships that ride on a cushion of air. How fast? Sixty-knots fast! That makes Steil and her sister ships the fastest combatants afloat. “We can go from engines at full idle to full speed in less than one minute,” says Lt. Cmdr. Johan Reinboth, Steil’s commanding officer. The Pratt & Whitney Canada engines – the same as found in commercial turbo-prop aircraft – provide the push, while diesel-powered lift fans maintain the air cushion that the ship rides upon. Steil was built at Umoe Mandal shipyard, and launched in 2008. She and her sisters are homeported at Bergen. Steil is very heavily armed for such a small ship. She has the Oto Melara 76 mm gun, which can engage air, surface and land targets and has a burst-firing rate of 120 rounds per minute. 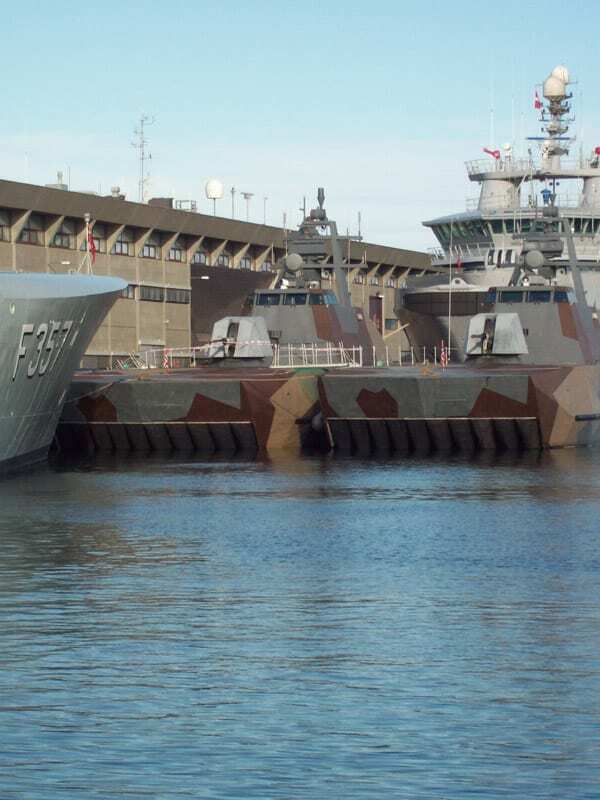 Steil also carries the Kongsberg Naval Strike Missile (NSM for Nye Sjoemaals Missiler, or Norwegian strike missile), carried on launch ramps that elevate in the aft end of the ship for firing. NSM can be launched based on targeting from a different source, and fly based on GPS, inertial navigation, or a terrain reference system for contour following. The missile can attack in sea-skimming mode, or fly up, over and around landmasses. Steil can be hiding in one fjord, receive targeting from a different source, fire its missile and hit the target, which may be in another fjord, oblivious to what’s about to happen to it. 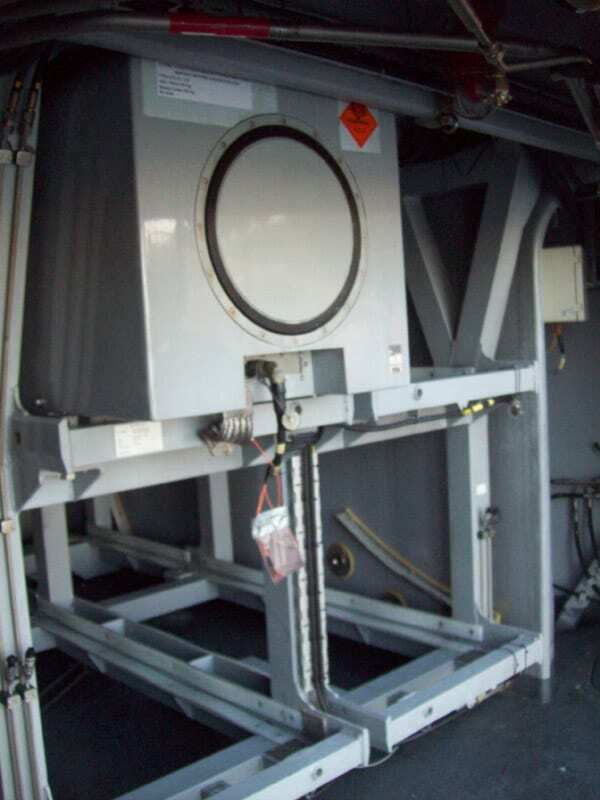 It can also independently detect and recognize hostile targets at sea or ashore with its onboard target database. The IR seeker is used in terminal phase. The random terminal-phase maneuvers make it very hard to defeat. “This missile is very sophisticated,” Reinboth says. Steil carries the MBDA Simbad portable system incorporating infrared-guided Mistral short-range surface-to-air missiles for air defense. For sensors, Steil has the multirole Thales 3D radar and the Saab Ceros 200 fire control radar – which includes a Ku-band radar target tracker, optical video camera and tracker, thermal imager and laser rangefinder – along with the Rheinmetall MASS decoy system. The sensors and weapons are integrated with the Senit 2000 combat management system, a product of DCNS and Kongsberg Defense and Aerospace. Reinboth says Steil is extremely maneuverable – even at high speed and in shallow water – because of the steerable waterjets. As both a catamaran and an SES, he says it’s also very seaworthy. The vessel displaces just 275 tons. To reduce weight, corrosion and magnetic signature, virtually all piping is made of titanium or glass reinforced fiberglass. “It’s noisy, and it rides hard. That’s the price of being fast and lethal,” Reinboth says.